Different types of shoes are called different things. 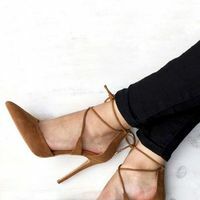 Pumps refer to high heeled shoes and it can be a classy way to show up anywhere, whether it is a party, prom, or even a wedding. During fashion week every year, new styles roll out in order to provide more diversity within your footwear choices. There are classic pumps that you can slip your feet into as well as ones that sparkle and may have various straps around the ankle. There are also sling back pumps, where the heel is cut out. Once you choose the pumps you like, it is all a matter of choosing the height of the heel.